Sewell Tax Services Inc prides itself on offering a variety of professional tax and accounting services for businesses and individuals. For questions about our pricing, please don’t hesitate to contact us for a free quote tailored to your specific needs. We are an authorized IRS E-Z Provider. For refund transfers, we do: bank checks, Money Clip Visa Prepaid Cards, Walmart Direct2Cash, and lastly, Direct Deposit. Our goal is to strategically help you devise a plan for the present and future taxes. Sometime doing everything make you forget the small things when running your business. We will help you manage and prepare your payroll transaction on a weekly basis as well as all the necessary forms needed at the year end. We will generate either a weekly or monthly report for you to show you the flexibility of your business income and expenses. Do you want to start a new or change the basis structure of your business? We can help you achieve this goal. GET A HEAD START ON YOUR BILLS. UP TO $6,000 EASY ADVANCE. 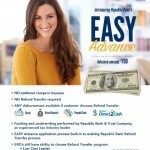 You may qualify for a Easy Advance Plus Loan up to $6,000.